And when I say big reforms, this isn’t exaggeration or puffery. Back in 1975, New Zealand’s score from EFW was only 5.60. To put that in perspective, Greece’s score today is 6.93 and France is at 7.30. In other words, New Zealand was a statist basket cast 40 years ago, with a degree of economic liberty akin to where Ethiopia is today and below the scores we now see in economically unfree nations such as Ukraine and Pakistan. But then policy began to move in the right direction, especially between 1985 and 1995, the country became a Mecca for market-oriented reforms. The net result is that New Zealand’s score dramatically improved and it is now comfortably ensconced in the top-5 for economic freedom, usually trailing only Hong Kong and Singapore. To appreciate what’s happened in New Zealand, let’s look at excerpts from a 2004 speech by Maurice McTigue, who served in the New Zealand parliament and held several ministerial positions. He starts with a description of the dire situation that existed prior to the big wave of reform. New Zealand’s per capita income in the period prior to the late 1950s was right around number three in the world, behind the United States and Canada. But by 1984, its per capita income had sunk to 27th in the world, alongside Portugal and Turkey. Not only that, but our unemployment rate was 11.6 percent, we’d had 23 successive years of deficits (sometimes ranging as high as 40 percent of GDP), our debt had grown to 65 percent of GDP, and our credit ratings were continually being downgraded. Government spending was a full 44 percent of GDP, investment capital was exiting in huge quantities, and government controls and micromanagement were pervasive at every level of the economy. We had foreign exchange controls that meant I couldn’t buy a subscription to The Economist magazine without the permission of the Minister of Finance. I couldn’t buy shares in a foreign company without surrendering my citizenship. There were price controls on all goods and services, on all shops and on all service industries. There were wage controls and wage freezes. I couldn’t pay my employees more—or pay them bonuses—if I wanted to. There were import controls on the goods that I could bring into the country. There were massive levels of subsidies on industries in order to keep them viable. Young people were leaving in droves. Maurice then discusses the various market-oriented reforms that took place, including spending restraint. What’s especially impressive is that New Zealand dramatically shrank government bureaucracies. When we started this process with the Department of Transportation, it had 5,600 employees. When we finished, it had 53. When we started with the Forest Service, it had 17,000 employees. When we finished, it had 17. When we applied it to the Ministry of Works, it had 28,000 employees. I used to be Minister of Works, and ended up being the only employee. …if you say to me, “But you killed all those jobs!”—well, that’s just not true. The government stopped employing people in those jobs, but the need for the jobs didn’t disappear. I visited some of the forestry workers some months after they’d lost their government jobs, and they were quite happy. They told me that they were now earning about three times what they used to earn—on top of which, they were surprised to learn that they could do about 60 percent more than they used to! And there was lots of privatization. …we sold off telecommunications, airlines, irrigation schemes, computing services, government printing offices, insurance companies, banks, securities, mortgages, railways, bus services, hotels, shipping lines, agricultural advisory services, etc. In the main, when we sold those things off, their productivity went up and the cost of their services went down, translating into major gains for the economy. Furthermore, we decided that other agencies should be run as profit-making and tax-paying enterprises by government. For instance, the air traffic control system was made into a stand-alone company, given instructions that it had to make an acceptable rate of return and pay taxes, and told that it couldn’t get any investment capital from its owner (the government). We did that with about 35 agencies. Together, these used to cost us about one billion dollars per year; now they produced about one billion dollars per year in revenues and taxes. Equally impressive, New Zealand got rid of all farm subsidies…and got excellent results. …as we took government support away from industry, it was widely predicted that there would be a massive exodus of people. But that didn’t happen. To give you one example, we lost only about three-quarters of one percent of the farming enterprises—and these were people who shouldn’t have been farming in the first place. In addition, some predicted a major move towards corporate as opposed to family farming. But we’ve seen exactly the reverse. Corporate farming moved out and family farming expanded. Maurice also has a great segment on education reform, which included school choice. But since I’m a fiscal policy wonk, I want to highlight this excerpt on the tax reforms. We lowered the high income tax rate from 66 to 33 percent, and set that flat rate for high-income earners. In addition, we brought the low end down from 38 to 19 percent, which became the flat rate for low-income earners. We then set a consumption tax rate of 10 percent and eliminated all other taxes—capital gains taxes, property taxes, etc. We carefully designed this system to produce exactly the same revenue as we were getting before and presented it to the public as a zero sum game. But what actually happened was that we received 20 percent more revenue than before. Why? We hadn’t allowed for the increase in voluntary compliance. And I assume revenue also climbed because of Laffer Curve-type economic feedback. When more people hold jobs and earn higher incomes, the government gets a slice of that additional income. 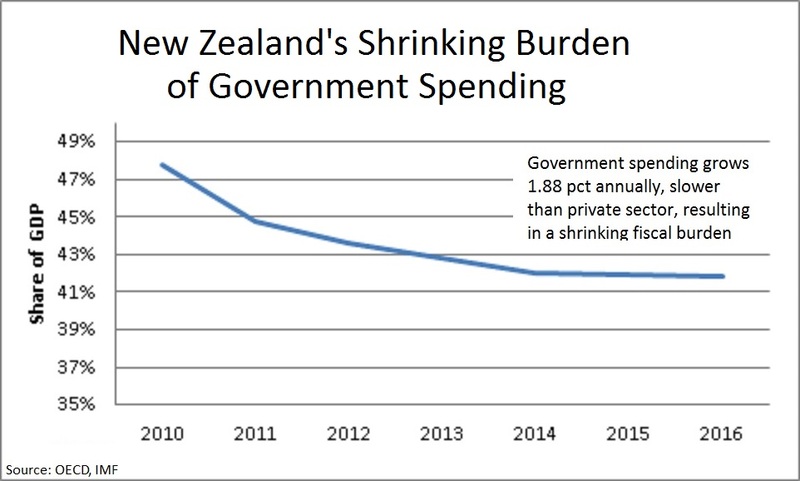 Let’s wrap this up with a look at what New Zealand has done to constrain the burden of government spending. If you review my table of Golden Rule success stories, you’ll see that the nation got great results with a five-year spending freeze in the early 1990s. Government shrank substantially as a share of GDP. Then, for many years, the spending burden was relatively stable as a share of economic output, before then climbing when the recession hit at the end of last decade. But look at what’s happened since then. The New Zealand government has imposed genuine spending restraint, with outlays climbing by an average of 1.88 percent annually according to IMF data. And because that complies with my Golden Rule (meaning that government spending is growing slower than the private sector), the net result according to OECD data is that the burden of government spending is shrinking relative to the size of the economy’s productive sector. P.S. For what it’s worth, the OECD and IMF use different methodologies when calculating the size of government in New Zealand (the IMF says the overall burden of spending is much smaller, closer to 30 percent of GDP). But regardless of which set of numbers is used, the trend line is still positive. P.P.S. Speaking of statistical quirks, some readers have noticed that there are two sets of data in Economic Freedom of the World, so there are slightly different country scores when looking at chain-weighted data. There’s a boring methodological reason for this, but it doesn’t have any measurable impact when looking at trends for individual nations such as New Zealand. P.P.P.S. 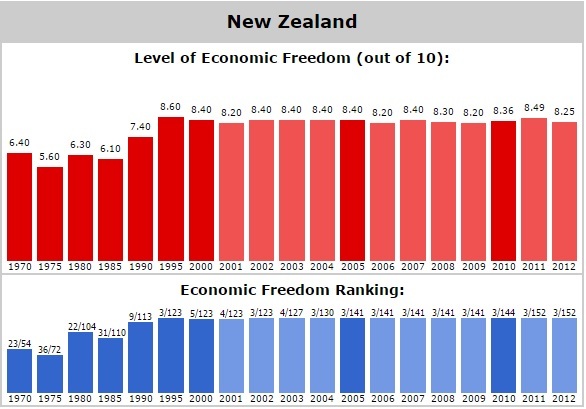 Since the Kiwis in New Zealand are big rugby rivals with their cousins in Australia, one hopes New Zealand’s high score for economic freedom (3rd place) will motivate the Aussies (10th place) to engage in another wave of reform. Australia has some good polices, such as a private Social Security system, but it would become much more competitive if it lowered its punitive top income tax rate (nearly 50 percent!). greetings from New Zealand….Bernadette and I came to NEW Zealand 50 years way back, on the 8th September,1967….great place to live, we have the same ‘problems’, as most countries…….poverty/housing/unemployed/people who do not want to work, people moaning all the time….now we have a young person who wants to change all this At our next election in September……back to the days of ‘roger the dogger’!! I’m too old to jump off the ‘planet’. As I keep telling the ‘greenies’……ALL IS NOT LOST!! regards to all, Trevor. Just a shame that despite all that good reform, NZ’s productivity (eg real GDP per hour worked) just keeps drifting slowly every further behind Australia’s (and Australia’s record isn’t stellar). Well the median balance in the Australian private pension system for a 50 year old at the moment is something like $30-40k in total from memory…so I wouldn’t get too excited. The rest of the world keeps giving us feedback on what works and what doesn’t, yet we continue on the wrong path hoping for change. We don’t want change, we want the free market’s big bucks!